Here’s an interesting story from from the Pittsburgh Post-Gazette (originally from the LA Times). PUERTO TRIUNFO, Colombia — Hacienda Napoles was Pablo Escobar‘s pleasure palace, a 5,500-acre estate where the notorious drug lord held court over million-dollar cocaine deals, parties with underage girls and visits by shadowy men of power. Escobar lived large here in his lush fiefdom 100 miles east of Medellín, far from the teeming slums where he began his life of crime. He built a bullring, an airstrip, an ersatz Jurassic Park with half a dozen immense concrete dinosaurs. He stocked a private wild animal park with hundreds of elephants, camels, giraffes, ostriches, zebras and other animals. He installed four hippos in one of the estate’s 12 man-made lakes. But the hippos were never claimed because they were too large and ornery to move. Now the original four have multiplied to 16 and, far from starving to death, as some expected, they have learned to forage like cows. Local authorities say they represent a safety hazard — and are standing in the way of plans to redevelop the late drug lord’s estate. Weighing as much as three tons, the hippos are not constrained by ordinary barbed-wire fences or gates. “The problem is, you cannot manage them,” said Francisco Sanchez, environmental officer of Puerto Triunfo municipality that has control of the mansion and the former zoo area of the property. “They are too big and wild,” said Sanchez, who said Escobar bought the original four from a dealer in New Orleans for $3,000 each. 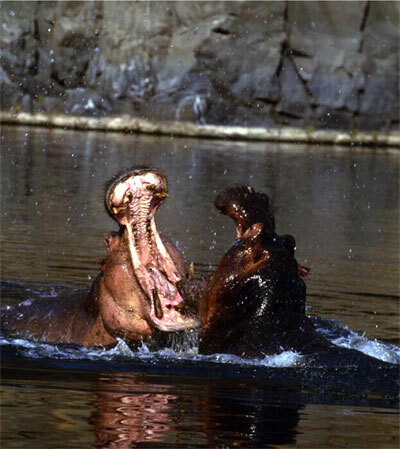 Among themselves, hippopotamuses, whose name means “river horse,” are gregarious animals, living in herds of up to 40 in their natural habitat: the rivers, lakes and swamps of a dozen African countries. They live up to 50 years, and the males grow to a hefty size, sometimes 12 feet long and five feet high. I love this story. Nature reclaims its own, whether it’s the jungle or, well, the hippos!